The Glorious 12th signalled the start of the grouse shooting season and Middlesmoor in Yorkshire’s Nidderdale Area of Outstanding Natural Beauty resounded to the sound of the first shots fired. A six-strong shooting party from Suffolk were on Lofthouse Moor to bag an early brace. The shooting party also stopped in at the ‘shooting box’ on the moor where the first freshly shot grouse of the day was plucked and cooked up on a hot grill. “Each year from August onwards, we welcome many grouse shooting parties which accounts for a significant proportion of our annual revenue. Being a destination place we very much rely on sporting parties, for both grouse and pheasant. Lofthouse Moor is one of 11 grouse moors in the Nidderdale Moorland Group; an organisation dedicated to promoting the positive benefits of moorland management and conservation. Nine estates recently surveyed by the Nidderdale Moorland Group show that they alone will be hosting 150 driven shoot days throughout the four-month season with many more expected to run on other estates across the North of England. It is estimated this will result in nearly 1000 overnight stays in Nidderdale hotels and the shoot days will directly contribute more than £100,000 to local hotels, restaurants and pubs throughout the season. 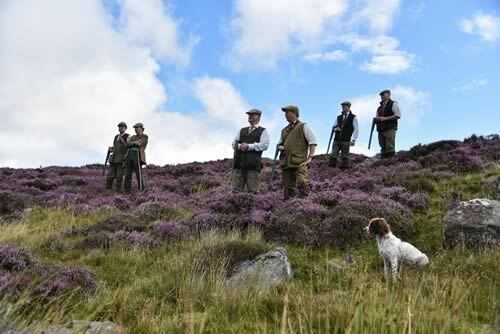 The survey also revealed that each grouse moor will employ around 35 people per shoot day, including local youngsters. Throughout the forthcoming season, an estimated 5,000 workdays of additional employment will be provided for those assisting on shoot days, including beaters, flankers, loaders, pickers-up and caterers. The Nidderdale grouse moors are also at the heart of conservation work including preserving heather moorland and peatland restoration under the Moorland Association banner.